When you have spent lots of time dreaming about your next holiday – budgeting, organising leave, accommodation and a getting a holiday-ready body, the last thing you want is to arrive at your destination and get sick. Once you’re on holiday, how do you stay healthy when there’s temptation everywhere? It’s in your best interests to maintain a good level of health while travelling, so that you’re less susceptible to injuries and illness. Here are some excellent tips on how you can get the best out of your holiday while being your best self abroad. It’s easy to have the best of intentions when it comes to incorporating exercise into your travel schedule, but it’s even easier to pack on extra kilos when the menus in exotic places are so enticing – not to mention the variety of beer and wine on offer! If you schedule a time to get some form of physical activity while you’re away, you’ll find that any extra indulgences won’t start to tip the scales. if you’re staying in a hotel with a gym, plan some time each day – early morning is best so you have the rest of the day to go exploring. at the beach, embrace the cliché and take a long walk along it. This is great in the morning to catch the sunrise, or at the end of the day where you can bask in the glow of a stunning sunset. beaches aren’t just great for walking, but swimming and surfing too. Have a splash in the surf with your friends, or if you’re feeling more adventurous, take a surfing lesson. It’s great for the abs. if you’re holidaying somewhere mountainous, look into local biking, hiking and jogging paths. City holiday? Try a yoga class, or throw on the walking shoes instead of using public transport. 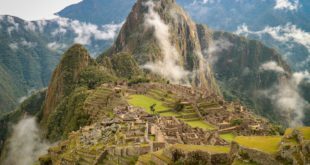 Wherever your holiday takes you, whether it’s in the hills of Nepal or the boroughs of Montreal, there are all kinds of physical activities you can do to stay in shape while you’re travelling. If you’re travelling with your family, grab a ball and hit the park for a friendly game of touch or throw a frisbee around. The kids will need to let off steam, so find a local playground and let the little ones hit the slide and swings to keep them active. Kiwis love a holiday sampling the gastronomical delights in exotic locations. From Bali to Portland, there are certain restaurants you just can’t miss out on while you’re holidaying. And one of the best parts of being on holiday is not having to cook your own food or clean up afterwards, so you’ll be dining out and often on your holiday. This is where the calorie intake jumps up and weight gain can happen, but if you plan ahead you can avoid the extra kilos. Planning where and what you eat is just as fun as planning your activities while you’re on vacation. This is not to say you can’t be spontaneous, but sometimes a little research can go a long way. If you look at the online menus of some of the restaurants you’re planning on going to, you can at least get an idea of the kinds of meals you’re be indulging in, and you can plan your activities around these meals accordingly. So, if you’re looking at the slow roasted pork belly with the star anise glaze instead of the garden salad, you can plan more activities into your day to off-set the extra calories. Another tip for eating well while you travel: stock up on easy to travel with snack-packs that you can carry with you while you’re wandering. You can easily pack small ziplock bags with fresh or dried fruit, cut veggies, seeds and nuts – and the high protein content will keep you going for most of the day. Fresh fruit will keep your levels of antioxidants and important vitamins high so you are also less likely to get sick. A lot of cities in South East Asia, Europe and North America have great street markets where you can fill up on local fruits and veggies for next to nothing. Also, be sure to budget in the price of water bottles while you’re travelling overseas, as depending on where you’re travelling you’re going to need to be vigilant about drinking enough clean water. Drinking a lot of water can help stave off your hunger during the day, so you can go to town on the best restaurant at night. Do not deprive yourself while travelling, but over-indulging in rich, fatty foods can lead to more than just a larger size of jeans. If you eat too much rich food you could find yourself in the local health clinic with an upset stomach and indigestion. This will affect your sleep and you won’t be able to keep up with your friends the next day. It’s been said countless times, and for good reason – everything in moderation. Are you looking for 50% Off your Travel Insurance? For more information, click here. Think twice before ordering a boozy drink with every meal when travelling overseas. 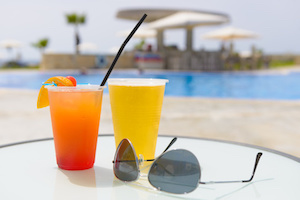 Ordering a poolside frozen margarita sounds like a great idea, but it’s going to blow your budget and your calories. Also, the extra sugar and alcohol can wreak havoc on your immune system, leaving you wide open to illness and disease. You’re on holiday with your pals and you want to unwind with a couple of drinks – you’re not alone! But it is possible to make healthy choices even when it comes to getting tipsy in a foreign town. Remember that half the fun of having a holiday is taking time to yourself and getting the rest that you don’t normally get back home when you’re working 9-5, or studying, or raising a family, or all three! Make sure you get at least 8 hours of sleep as proper rest restores the body and replenishes your energy stores. A comfortable bed helps in this department too, so consider your comfort when booking your rooms in foreign hotels and hostels. Remember, no matter how healthy you are, accidents do happen. Having travel insurance will not only give you peace of mind on your holiday, it will also help you out with whatever medical emergencies or travel issues that may arise. Plan your next trip with GrownUps now by clicking here and keep yourself protected with 50% Off your Travel Insurance? For more information, click here. Previous Article Reptiles and Amphibians of New Zealand: A Field Guide.